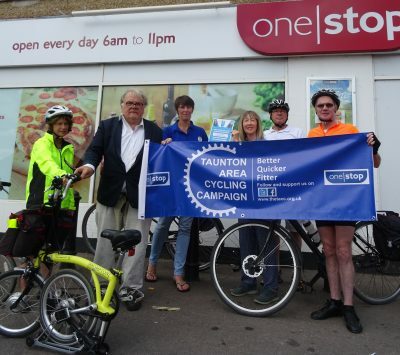 We are dead chuffed to have received a grant for £602 from store chain One Stop’s Carriers for Causes fund. This has significantly increased our campaigning capacity. to the on line consultation here by Friday 17 August. £5-10m investment in walking and cycling, as a ‘major scheme’ bid. 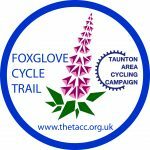 Tell the local authorities that cycling is important via this link. 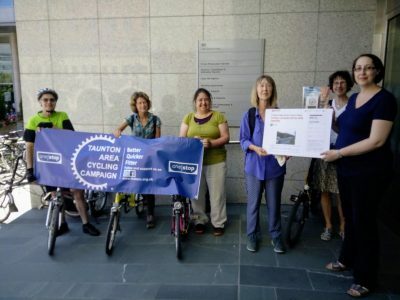 Our petition calling for proper cycle provision, as part of HE’s A358 scheme, was presented to HE in Bristol yesterday. The Regional Director, Nick Aldworth was due to receive it, but was called to Parliament to meet six South West MPs. Instead, we presented the petition to the Communications Manager Karen Duffet. 3. Confirmation that wherever the road cuts across quiet rural lanes, safe crossings will be provided. 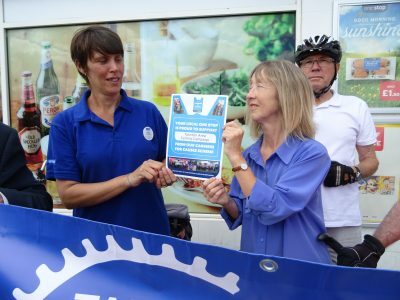 Our suggestions are line with Highways England’s own Cycling Strategy and the Governmen’ts Cycling Strategy. Highways England have a dedicated cycle budget of at least £100m. We were told that, among other things, the project team were looking into a separate budget they have access to, in order to make walking and cycling provision. There are likely to be follow up discussions once they announce their ‘preferred route’ and we will be demanding that this takes place. In case you missed us in the town centre on the 9th June, you’ll be able to collect a copy of the map from the Market House, from the weekend. Come and test run the Trail on our led ride on 17th June. 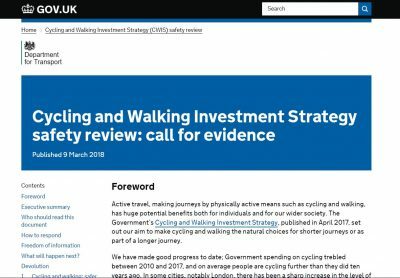 Early 2018 the Department for Transport has ran a consultation on ways to make cycling and walking safer while supporting the government’s ambition to increase cycling and walking. There are six topics in this review in relation to the safety of cyclists and pedestrians. These topics concern the impact of road signs and infrastructure, laws and rules relating to road safety and their enforcement, training and educating road users, government policy on vehicles and equipment, and understanding and awareness of different types of road users in relation to cycle use.